2007 Saturn Aura sedan - based on Epsilon and previewed with the Aura concept at Detroit in 2005, this car is a darn sight better than the L-series Saturn tried, and failed, to use to break into the mid-sized sedan market. 2007 Saturn Outlook crossover - bigger than a VUE...in fact, interior room is similar to that of the Tahoe/Yukon body-on-frame SUV's from GM. Initially expected to be available with 3.6l 250+hp high-feature V-6 power - this should help drive cross-over buyers to Saturn showrooms. 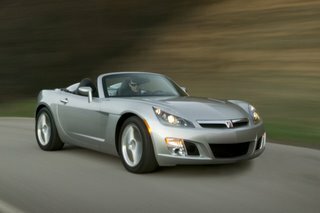 2007 Saturn Sky Redline - basically the same as the Opel GT shown earlier this month in Geneva. The Sky RL will go on sale 'in the fall' - which I suppose gives GM until almost Christmas to get it to dealers.